TODAY’S forecast interest rate rise is not all bad news for borrowers, according to local real estate agent Scott Mackey. The Bundaberg Remax Precision owner, along with Suncorp Bank general manager Terry Wasmund, said borrowers could look at another rise optimistically, as it reflected a stronger economy and more stable employment environment. “I believe this rate rise is a positive. This 25 basis point increase shows that the Reserve Bank of Australia (RBA) believes confidence has returned and is a result of the smart money coming back into the market,” Mr Mackey said. The interest rate rise was another step on the road to recovery from the global financial crisis, a road that was coming to an end, according to Mr Wasmund. “Further increases in rates signal we’re coming to the end of the financial crisis in Australia,” he said. Mr Wasmund said the low rates previously experienced were intended for a much weaker economy and allowed Australia to keep recession at a safe distance. “People need to be aware that the interest rates we recently experienced were at an all-time low and future rises by the Reserve Bank of Australia are inevitable,” he said. 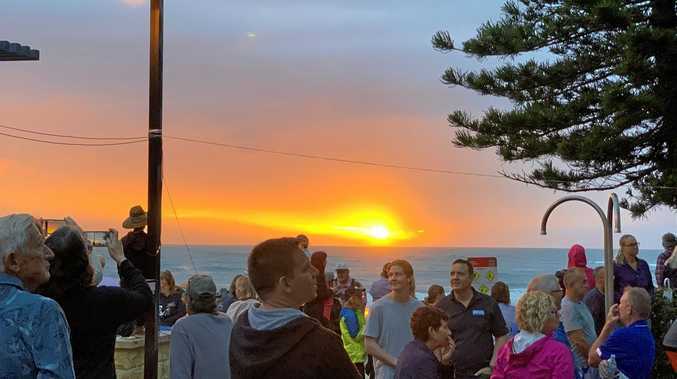 News UP TO 3,000 people gathered in Bargara for this morning's dawn service around the Bargara War Memorial.